Happy Thursday, friends! 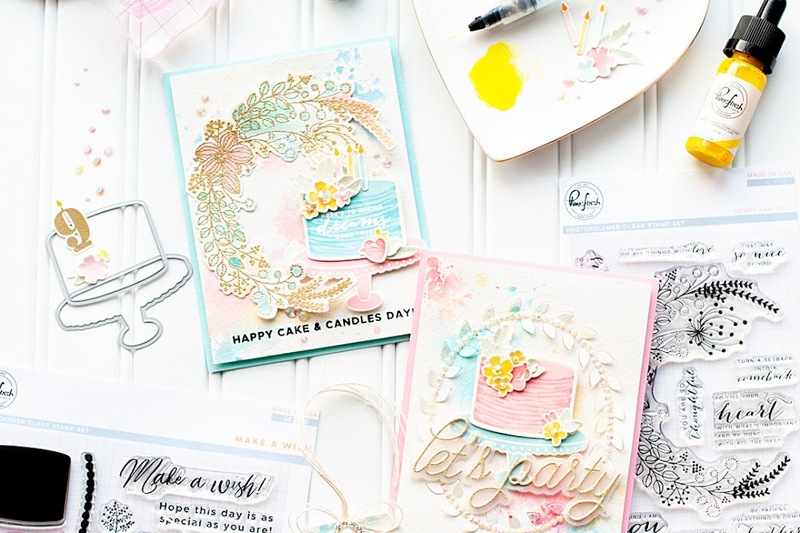 Just wanted to pop in really quickly and share some cards that I made with Tim Holtz's NEW STAMPtember® 2018 Exclusive stamp & stencil set! I've created 4 cards (as shown above), so this post might be quite lengthy. I will try to keep it as short & sweet as possible! 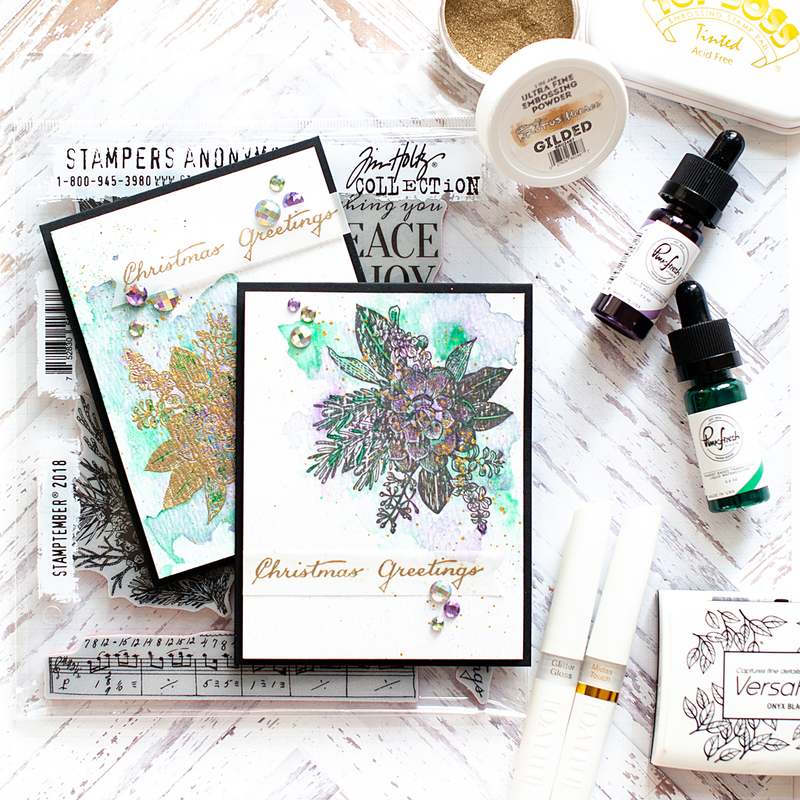 This stamp set is really beautiful - I love how botanical it is, and the vintage feel of the sentiments! 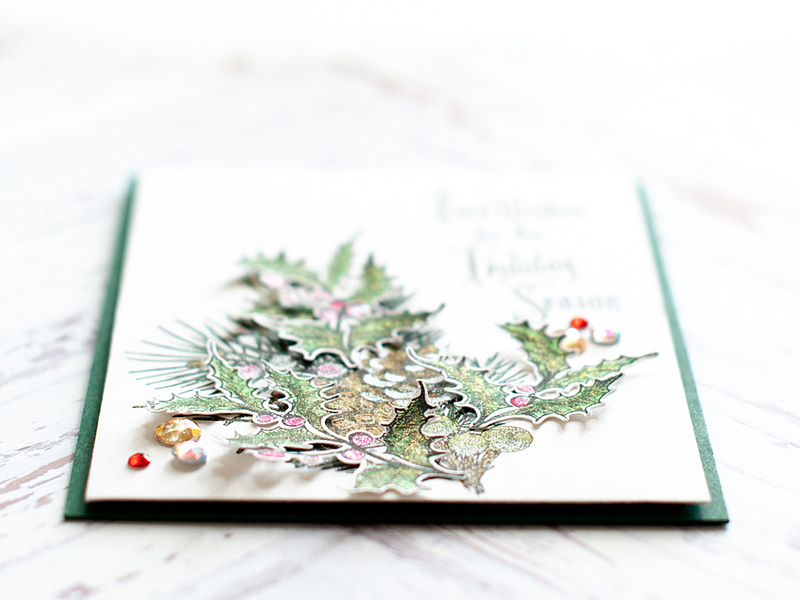 It is a super versatile Christmas set that I think you will LOVE creating with! 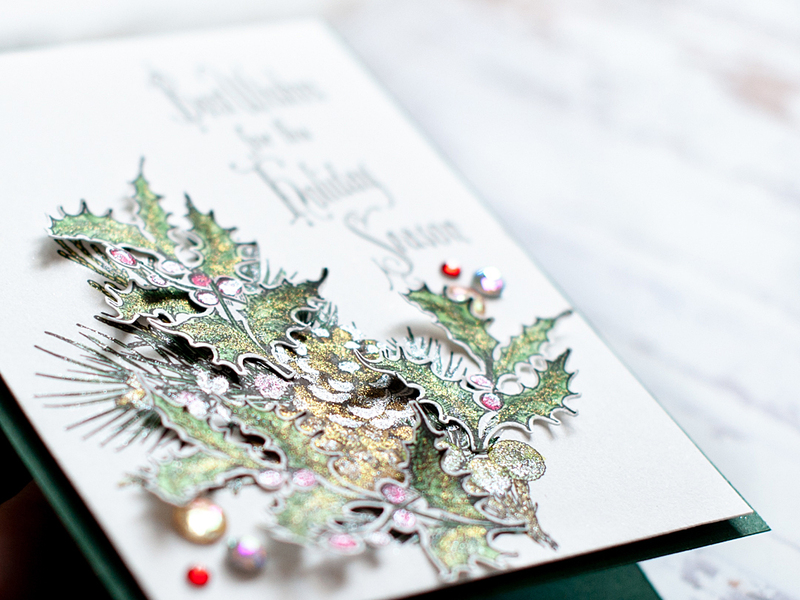 And even better - most of the images can be used year round, depending on how you color them! First up, I made a set of cards in a non-traditional color palette. 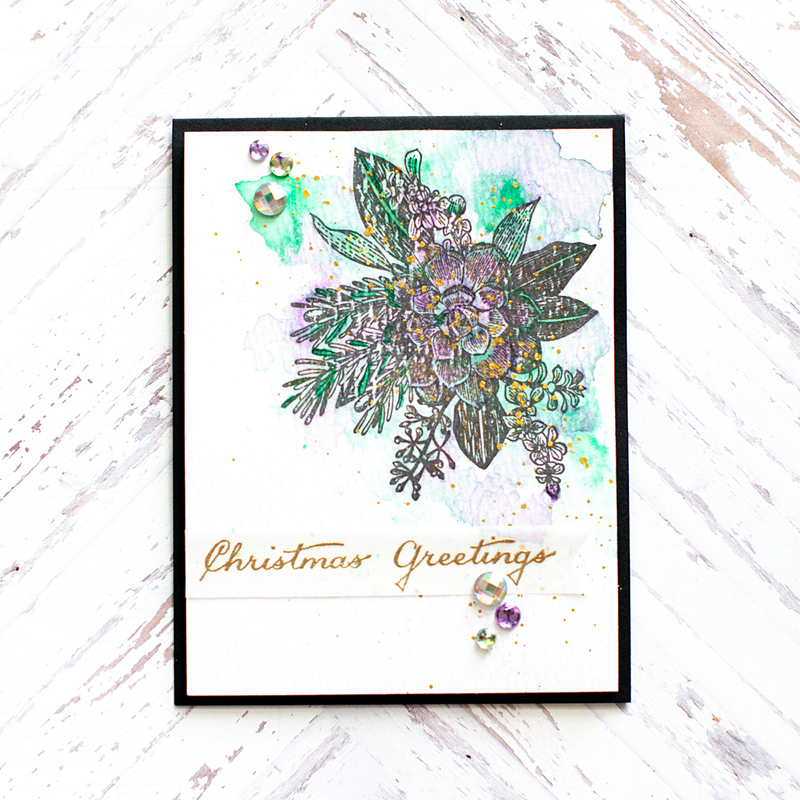 I loved that this is a succulent, so I chose to go with the pastel green & purple that succulents tend to be, but still used it for Christmas. You could easily exchange out the sentiment, and use this image any time of the year! 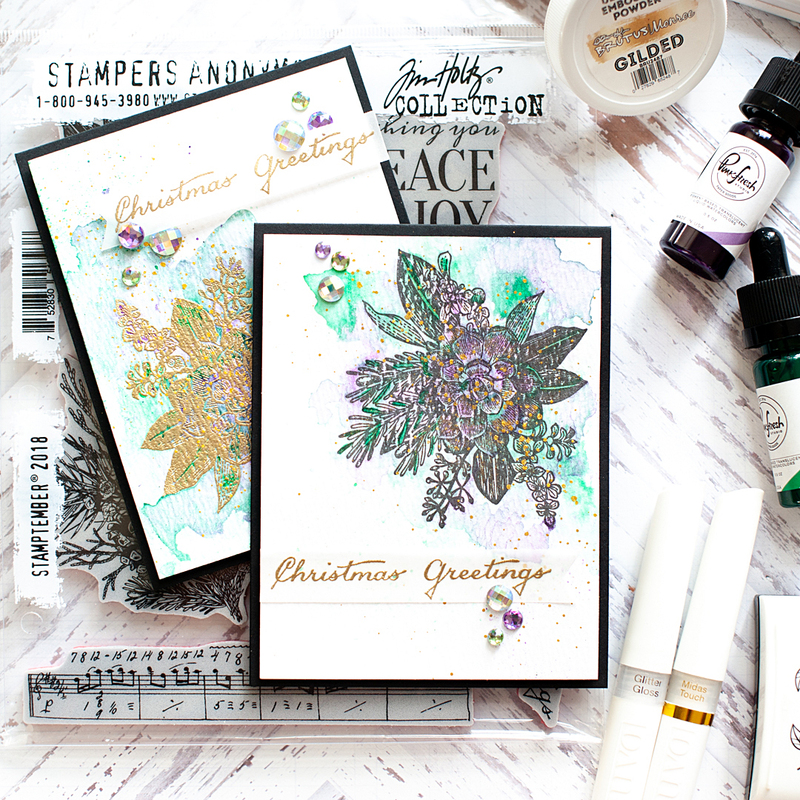 For this set, I stamped the image to Tim Holtz watercolor paper. One is stamped in onyx black Versafine, and the other is heat embossed with embossing powder in Gilded. 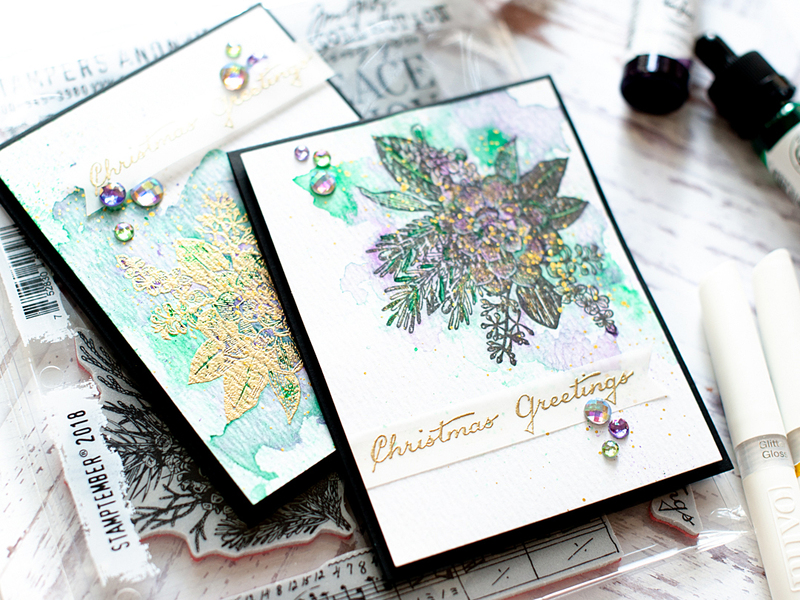 Then I watercolor smooshed over the images using my Pinkfresh Studio liquid watercolors in Emerald City & Lavender. I let them fully dry, then splattered them with gold paint as well. 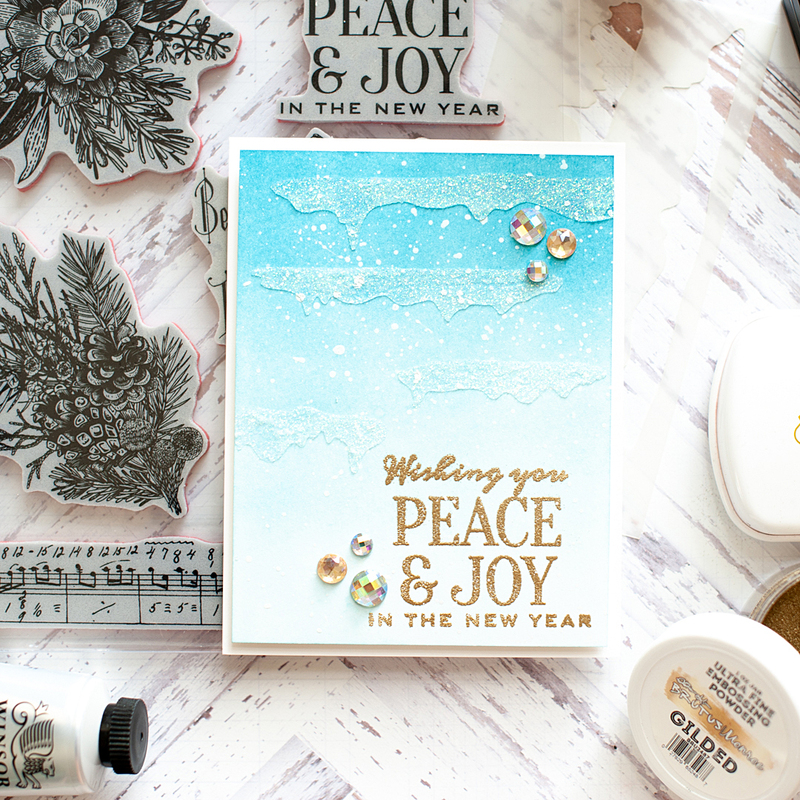 While waiting for the paint splatter to dry, I stamped & heat embossed the sentiment two times to vellum in matching embossing powder. Then I mounted the watercolor panels to the front of top folding A2 black cards with foam adhesive, then added the sentiments as well. 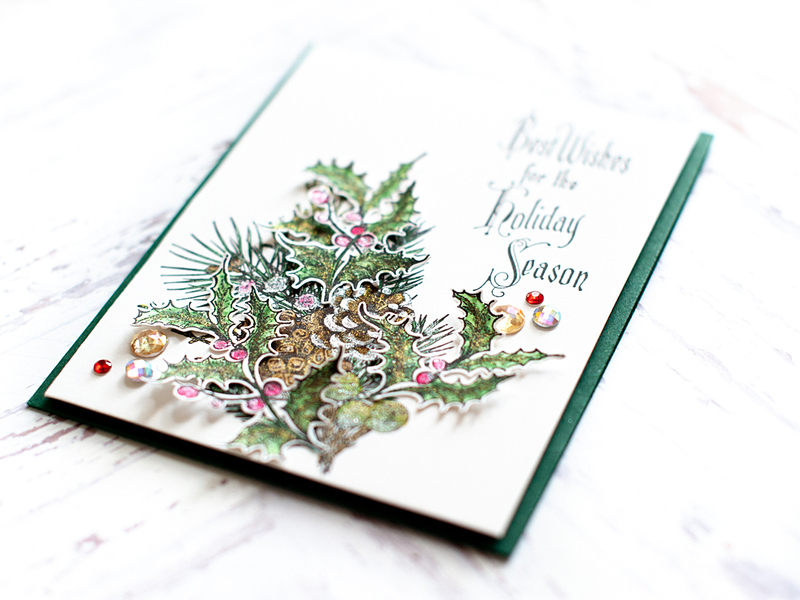 The final step was accenting with my signature jewels tucked here & there! 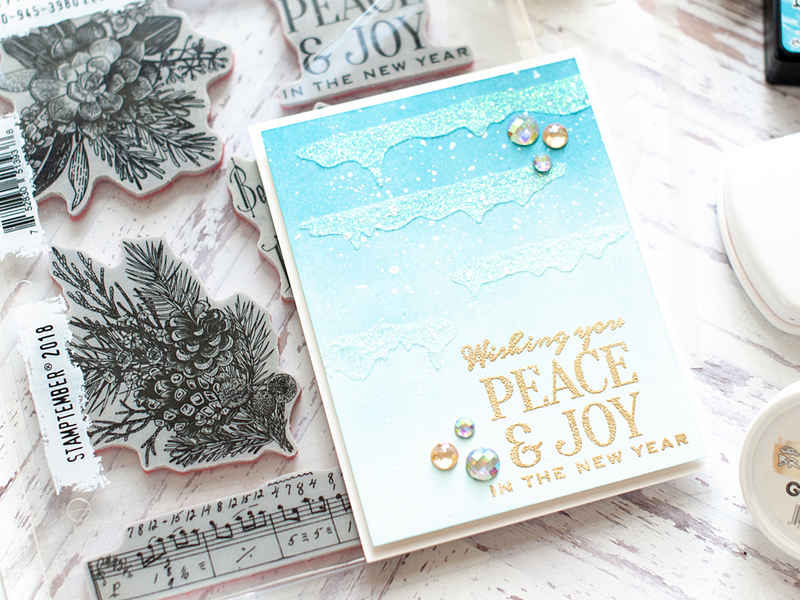 For my next card, I used paired the larger sentiment from the stamp set with one of the amazing stencils. 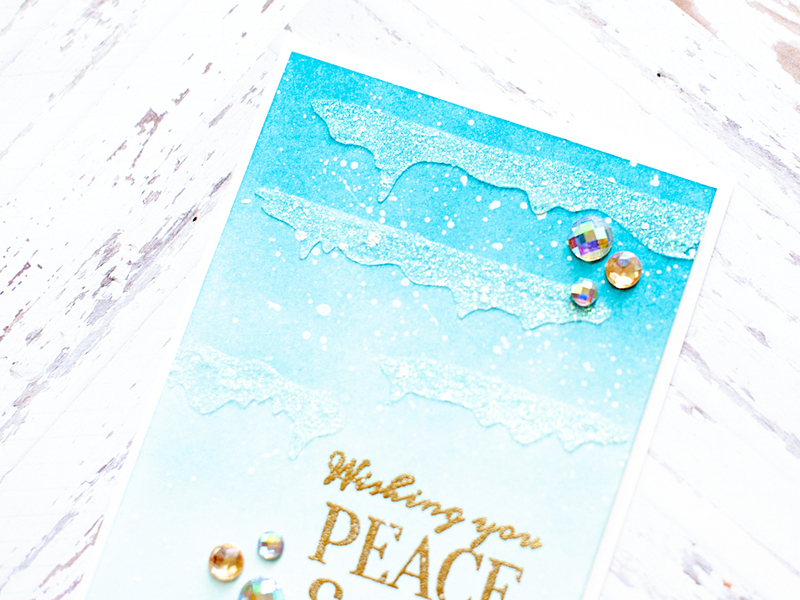 I think that these are technically snow mounds, but I turned them more into icicles for my card! 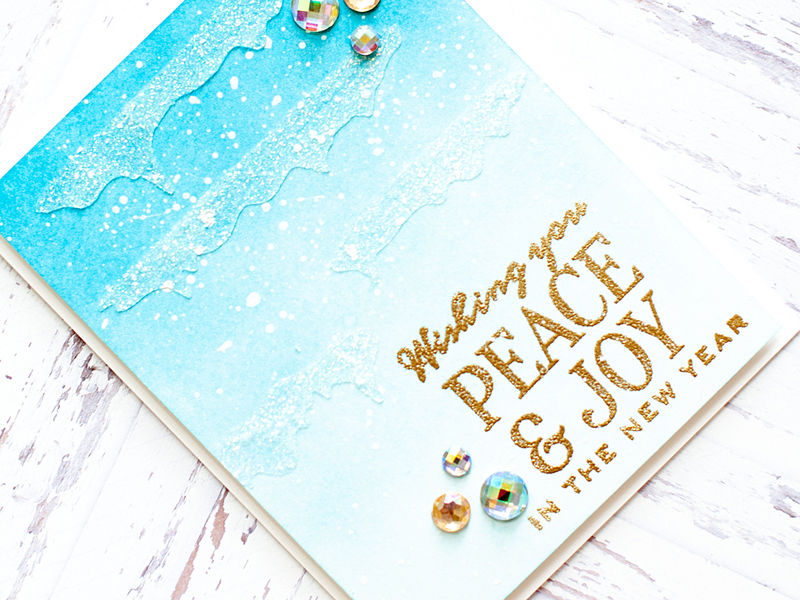 To start, I blended distress inks to the front of a white cardstock panel in an ombre gradient from darker to light. I used Broken China and Tumbled Glass. Then I stenciled the icicles to the front in Nuvo Glimmer paste, and let them set. 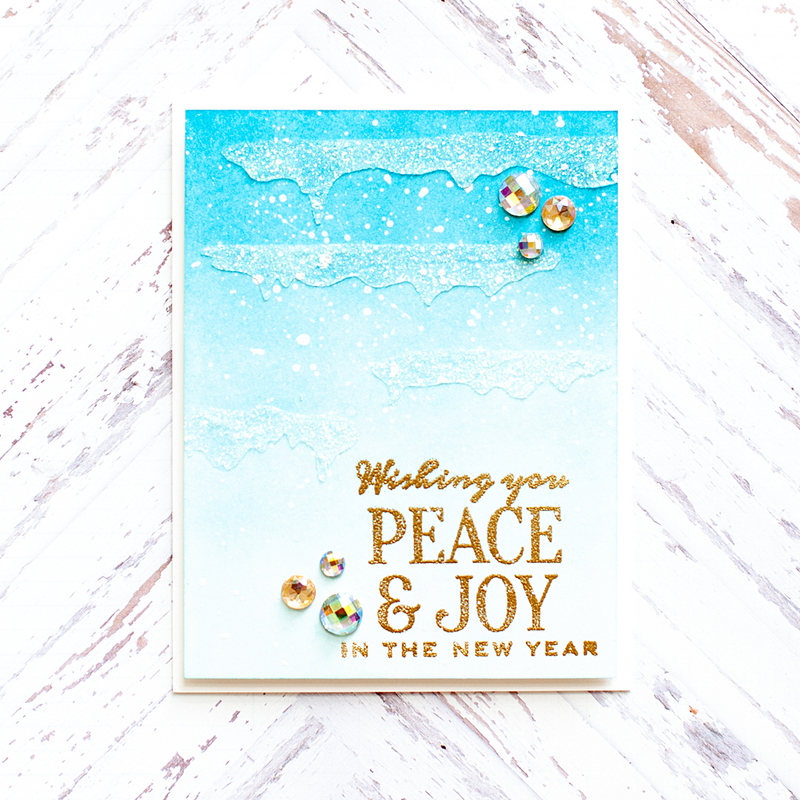 Then I stamped & heat embossed the sentiment to the lower right corner in Gilded embossing powder. I mounted the panel to a white card front, then realized that I felt like it needed something else. So I added some white snow splatters to the front using diluted acrylic paint in Titanium White. 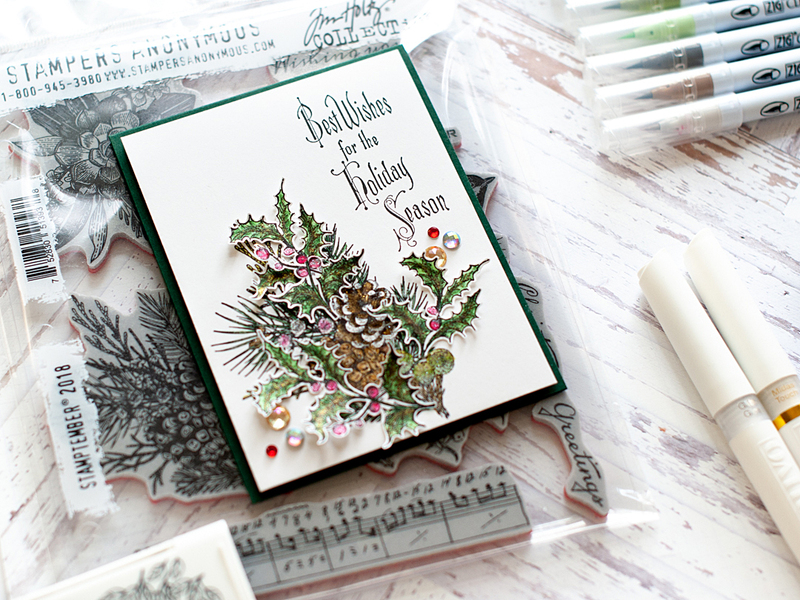 Then finally, I accented here & there with my signature jewels to finish! 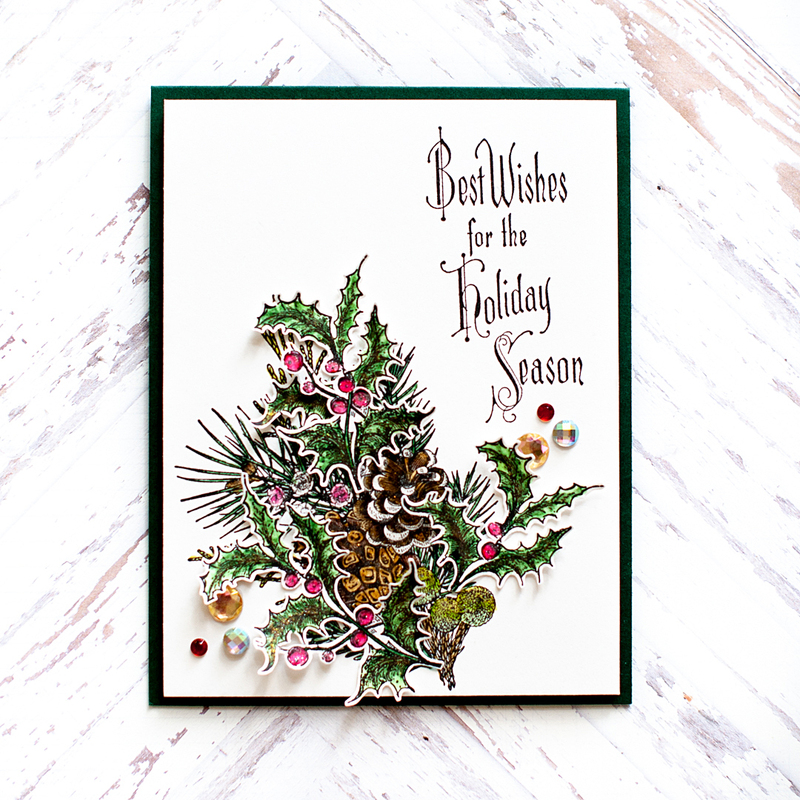 I created one final card using the other sentiment, the pinecone image, and holly. 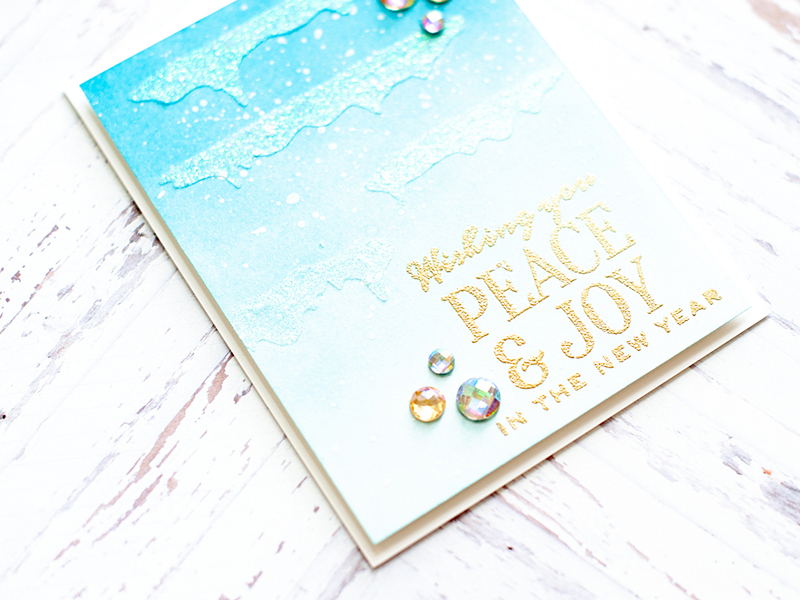 I did some coloring and fussy cutting on this one...and added a whole lot of glitter! 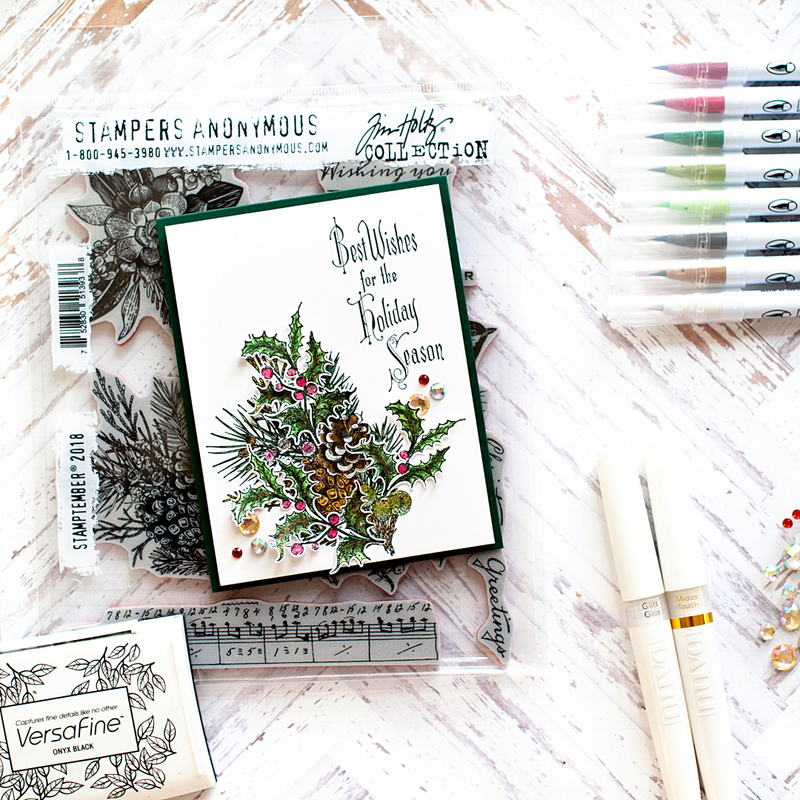 To start, I stamped the pinecone image & sentiment to a white cardstock panel in onyx black Versafine. 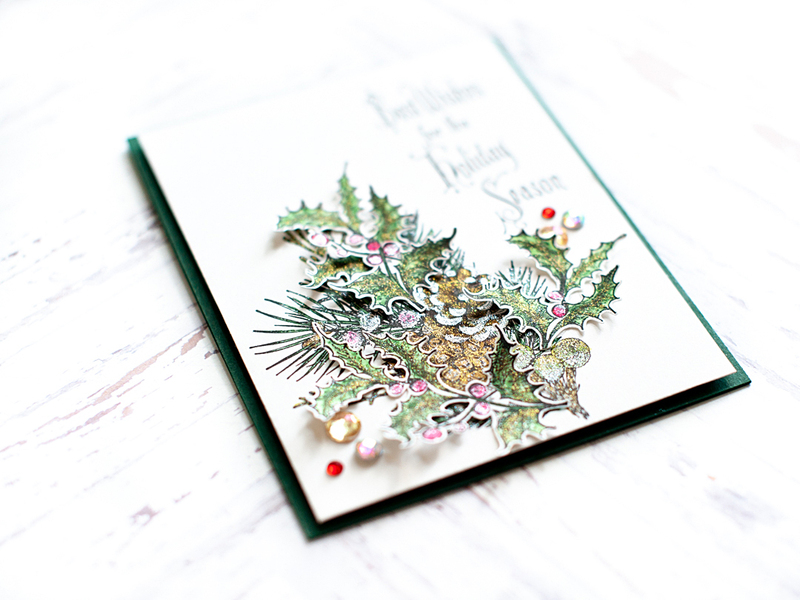 Then I stamped the holly three times to another cardstock panel. I proceeded to color the images in with my Zig Clean Color Real Brush markers. I have the 90 set, but forgot to record all the colors I used. Super sorry about that friends - it was a huge oversight. 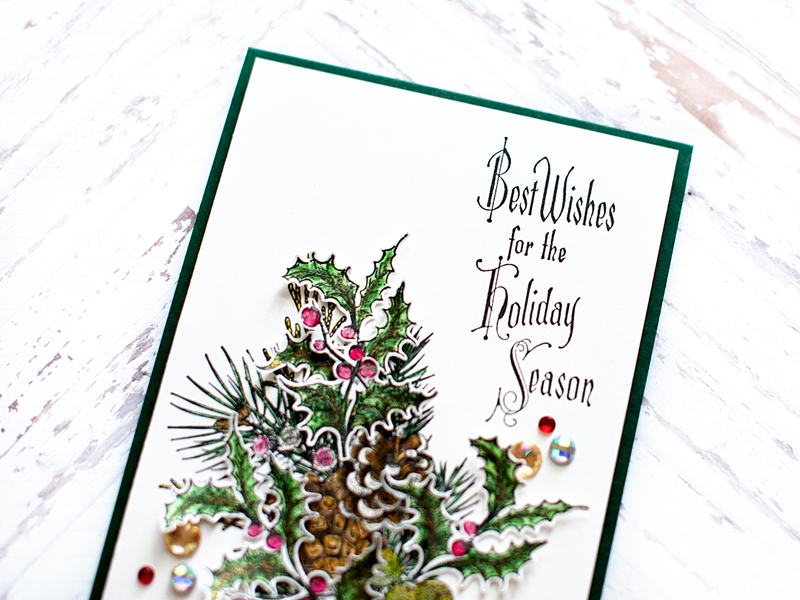 The colors are quite traditional, so just use greens, red & browns. With the coloring done, I mounted the colored panel to a green top folding A2 card base using foam adhesive. 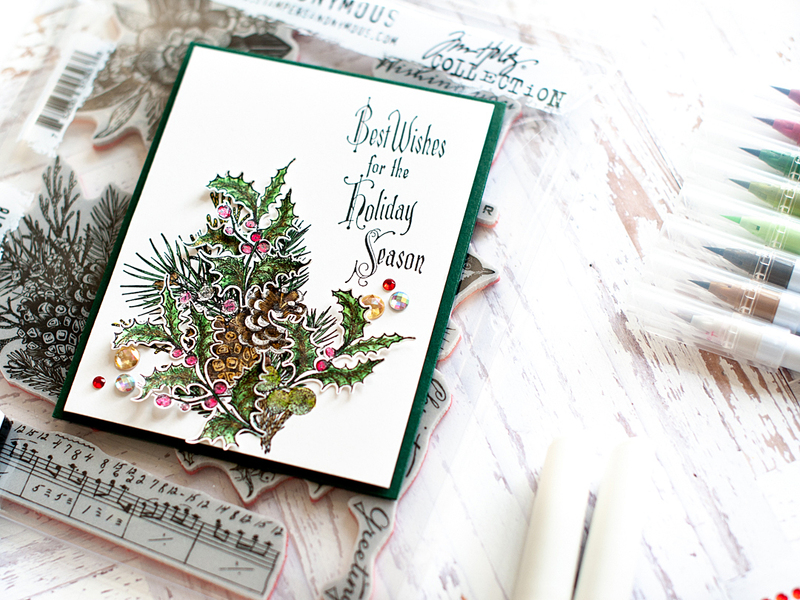 Then I fussy cut the holly, and accented the pinecone image with it. I only adhered down the middle sections of the holly so that the leaves could keep some dimension. 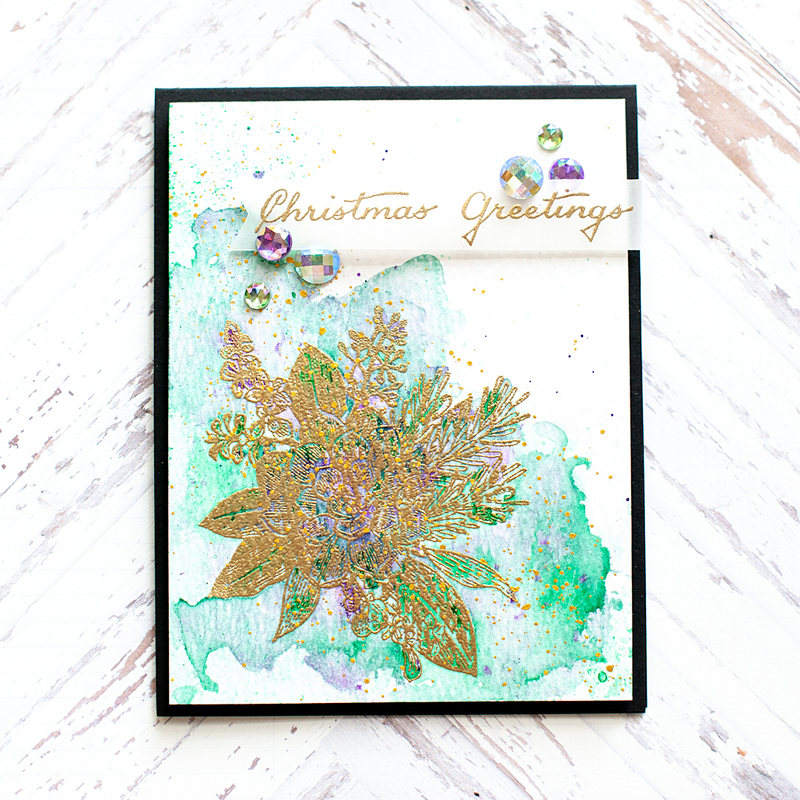 Once the holly looked how I wanted it to, I doused all of the colored images with my Tonic Aqua Shimmer pens - I used both clear & midas touch. 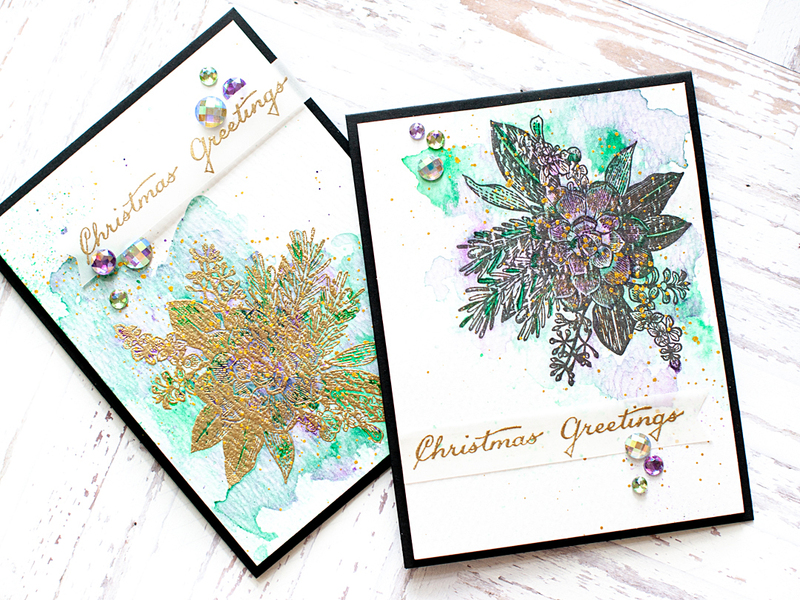 I love the warmth that the gold from the Midas Touch pen adds to Christmas images! And finally, I accented here & there with jewels to finish. 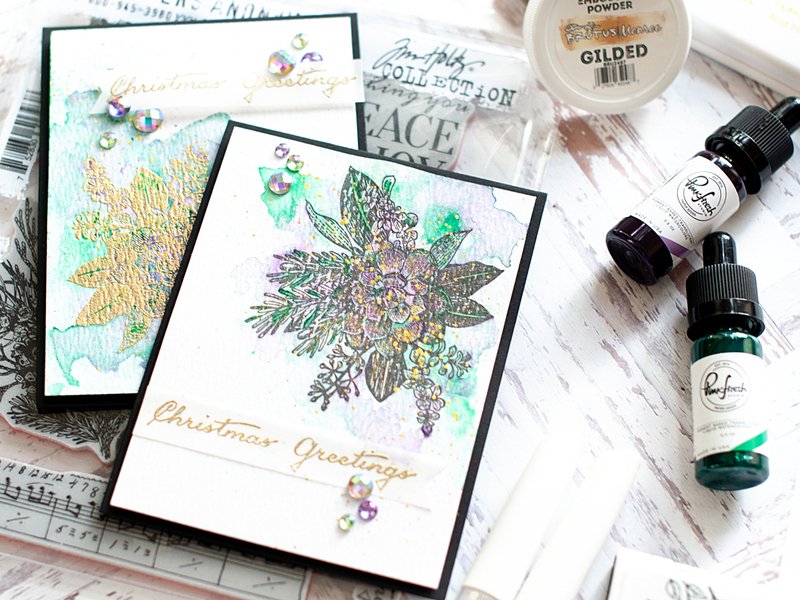 Here is a close-up of all the glitter - eeeek! 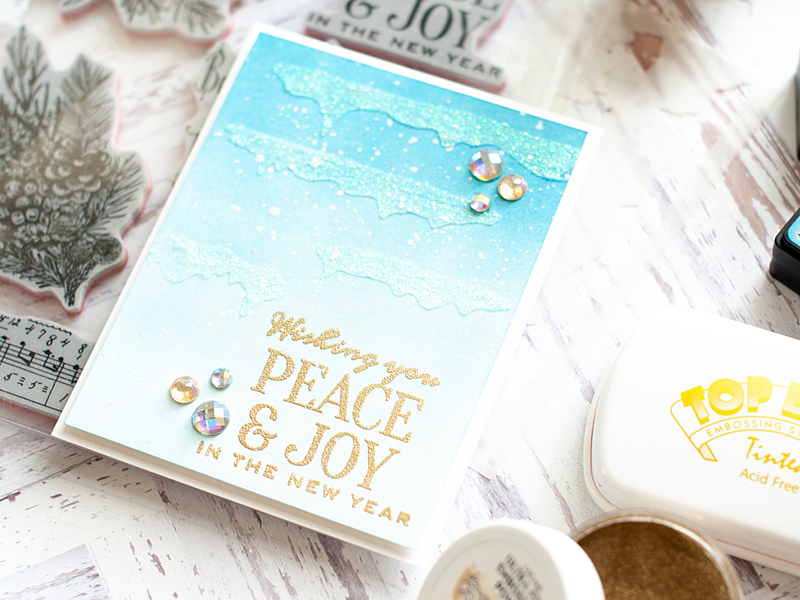 I just adore shimmer & glitter & shine! Alright friends - that is all I have for you today! 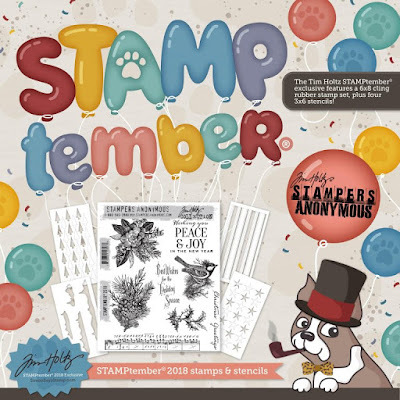 If you are interested in getting this Tim Holtz's NEW STAMPtember® 2018 Exclusive, I would jump on it...because once it's gone, it's gone for good! 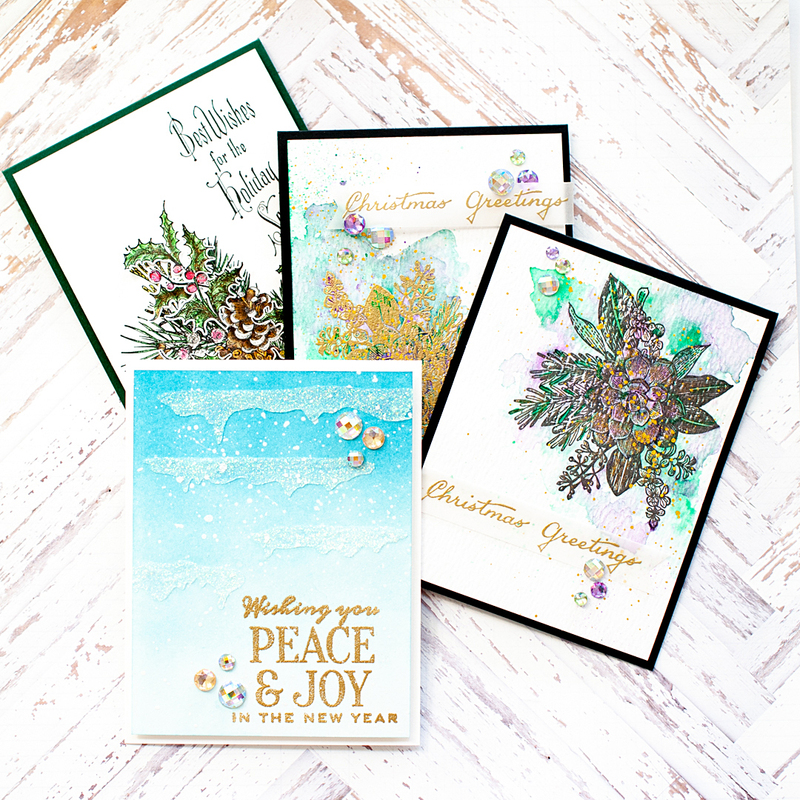 Unfortunately, my cards are just sitting at the Prescott post office for some reason....they have been there since this weekend and were supposed to be delivered to Tim on Monday, but that never happened. 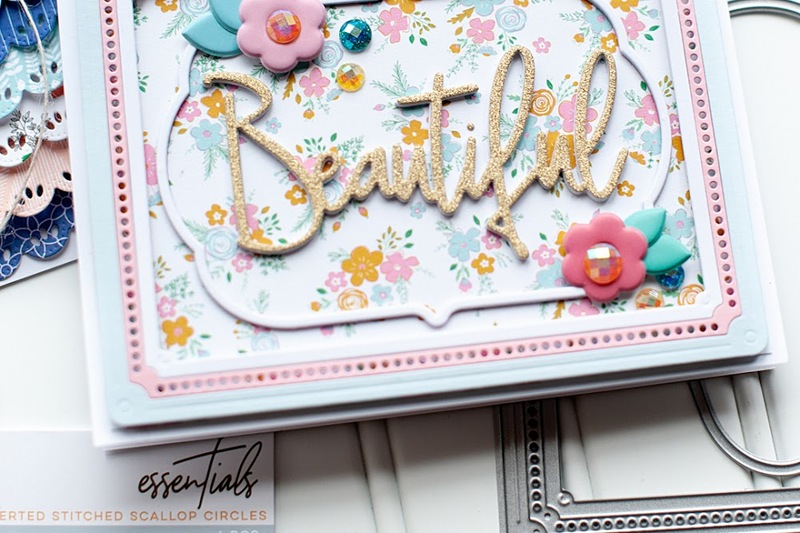 So, they didn't make his Facebook Live video...but there is so much inspiration on that video using this set, and I highly recommend watching it! Before you move along with your day, I wanted to invite you to follow me on social media. I hang out on Instagram a lot, and share my work in progress in my stories...along with REALLY cute photos of my dogs! :) Plus, I just started my YouTube channel this year, and while there are only a handful of videos right now...I will be adding new content consistently now that I've gotten the video process all set up on my new laptop. Have a wonderful rest of your Thursday! 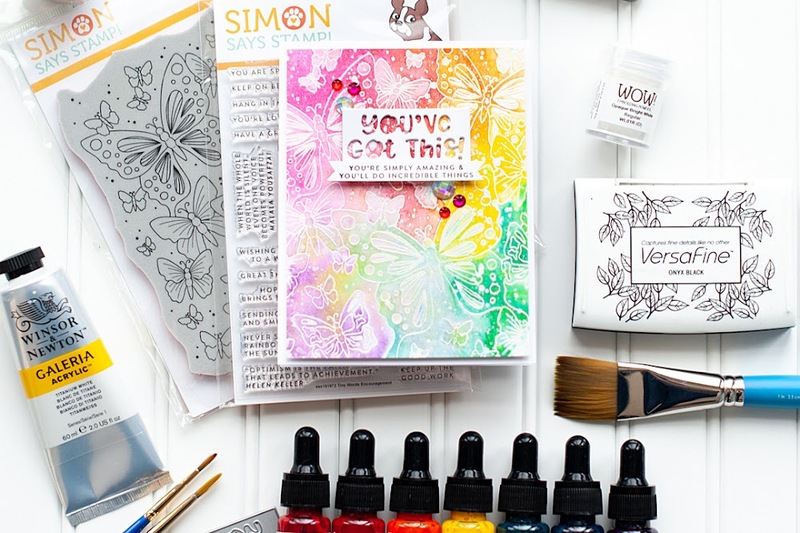 Simon Says Stamp - STAMPtember Party! !